Natural heavy metal chelator: lead, cadmium, mercury, nickel. Helps boost the immune defences. Zeolite clinoptilolite is a natural mineral in volcanic rock with strong absorption properties and high ionic exchange capacity. It undergoes high pressure micronization to further increase its exchange surface by boosting numbers of submicronic particles. At this point, it becomes micronized zeolite clinoptilolite (ZCm). ¤ ZCm has a negative chemical charge which is rare in a mineral. Under the microscope, it can be seen to create a cage-like structure enabling it to attract and trap heavy metals and other positively-charged toxins. ZCm is thus a major detoxicant. ¤ We now know that many diseases are linked to toxins absorbed by the body such as environmental pollutants and those found in the home, various synthetic products, heavy metals, the majority of cosmetics and the numerous pollutants found in food. ¤ This toxicity results in a deficient immune system and can produce a number of health problems, including anaemia, memory loss, cancer, depression, male infertility, gingivitis and possibly even multiple sclerosis and Alzheimer’s disease. ZCm is a useful weapon which can help mitigate against these toxicity-related diseases. ¤ Zeolite powder is natural chelator of heavy metals : lead, cadmium, mercury and nickel. It can therefore be used alongside DMSA and EDTA. It can also bind to other pollutants and microbes and facilitate their elimination from the body. 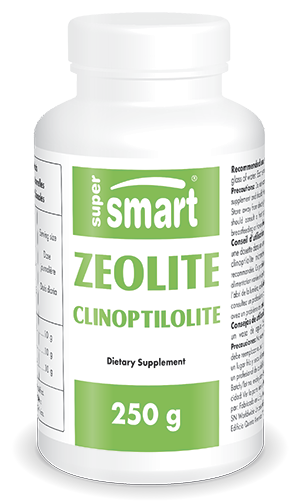 ¤ Zeolite supports the immune system, in conjunction with a diet adapted to boost its efficacy. It de-acidifies the body and balances gut flora. Studies show an improvement in volunteers’ general condition due both to stronger immune defences as well as the anti-radical support provided by zeolite. ¤ Zeolite combats oxidative stress by countering the effects of free radicals, known to be behind a great many diseases : diabetes, cancer, cardiovascular problems … Studies conducted in Austria by Professor Abuja and by genetics experts have demonstrated, with photometric measurement, a sharp reduction in free radicals. Research on mice has also shown zeolite to reduce lipid peroxidation in the liver. It therefore counts as one of the substances capable of delaying ageing, by inhibiting the various diseases induced by free radicals. ¤ Other studies have shown that zeolite is a natural adjuvant in anti-cancer treatments. In mice and dogs with cancerous tumours, zeolite clinoptilolite treatment improved their general health, prolonged their lifespan and reduced the size of their tumours. In vitro studies have also shown that it inhibited protein kinase B, induced expression of tumour-suppressor proteins and blocked cell growth in several cancer cell lines. ¤ Tests conducted in Austria by Professor Wolfgang Thoma demonstrated an increase in length and quality of life (particularly the return of appetite) in patients who had just undergone chemotherapy, supporting its adjuvant effects in reducing the side effects of such treatments..
¤ Taking ZCm has also been shown to benefit sportspeople as it significantly improves physical condition and performance, leading to decreased lactic acid and heart rate during exercise and faster recovery. ¤ A number of trials conducted in hospitals and universities, using in vitro and in vivo toxicological analysis, have shown micronized zeolite clinoptilolite to be completely safe and free from side effects. Along with zeolite clinoptilolite, other heavy metal chelators are available to purchase from the SuperSmart catalogue such as EDTA and DMSA. For an optimal body detox, you may also be interested in Humic & Fulvic Acids. Combining fulvic and humic acids, the composition of this supplement is based on a formulation from traditional Indian medicine. Adults. Take 1 to 2 dosettes a day. Mix one dosette in a glass of water. Each dosette contains 5 grams of micronized zeolite clinoptilolite.